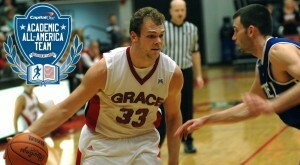 According to a story on the online news site, Stacey Page Online, a Grace College basketball player has been recognized for his academic and athletic achievements. Greg Miller has been named to a Capital One All-District Team. A portion of the story appears below. Click here to read the complete article. WINONA LAKE – Grace College senior Greg Miller was recognized for his academic and athletic achievement when he was named CoSIDA Academic All-District for the second straight year. The Capital One All-District Teams, selected by CoSIDA, honor student-athletes from the NAIA as well as NCAA Division I, II and III who have earned at least a 3.3 GPA. The members of the College Sports Information Directors of America (CoSIDA) then vote through the district and national round of winners from eligible student-athletes. Miller earned CoSIDA Second Team Academic All-America® recognition as a junior. The All-America® teams will be released on Feb. 17.